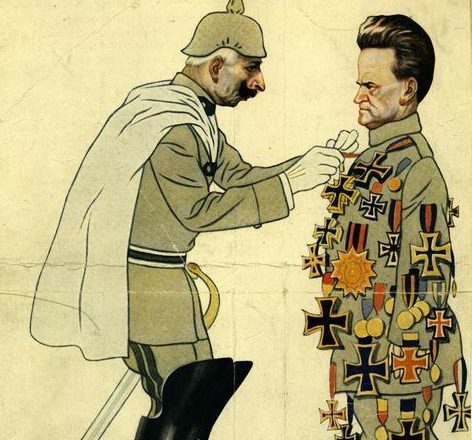 A color cartoon depicting Robert M. La Follette, Sr. as pro-German, showing Kaiser pinning medals on him. The Door County Historical Society hosts its monthly dinner program, “Over Here: Wisconsin Home Front During WWI,” presented by Leslie Bellais, on Sept. 24, 6 pm at the Alpine Resort in Egg Harbor. The program discusses how a variety of Wisconsin citizens experienced the state’s tense atmosphere during the 18 months that America participated in WWI. Shortly after the United States entered the war, Wisconsin became known as America’s “Traitor State.” Bellais, Curator of Social History, discusses the ways a variety of Wisconsin citizens experienced the state’s tension-filled atmosphere. Bellais holds a Master of Arts degree in pre-1815 United States history from the College of William & Mary. She spent four years as a curator at the Hershey Museum in Pennsylvania and was hired by the Wisconsin Historical Society to be their Curator of Costume of Textiles. The dinner includes a choice of roast pork, beef rouladen, or Door County salad with chicken. All dinners include rolls, choice of coffee, tea or lemonade and assorted dessert bars. Dinner and program fees are $21 for Society members and $25 for guests. Arrive a few minutes early for check-in and seating. Program-only fees for guests are $10 and $5 for members.